She shares a room with a stuck-up brat who thinks that she and her pony are the best. It's only later that she realizes it doesn't matter how expensive your horse is, or how good your trainer is, its about the bond that you form with your horse. This book is really exciting and it taught me quite a bit about making the right friends, and decisions for your horse. It's a really great book...and I love it!!! Lani is my fave character, she is sooo cool! Then Honey! She's a legend! Then Dylan then Mal.. Lindsey is such a try hard! These books are awesome! I want to read more... I've only read Playing 4 keeps, The new class, Heart of gold & All or nothing. Horses are and always will b my fave animal... They are that Gorgeous!!!!!!! Omg! is the place real? PS: Lauren Brooke you are my favorite "horse book"
THIS SERIES IS SO GOOD! IT IS ONE OF THE BEST SERIES EVER! THESE ARE MY FAVE BOOKS EVER!!!!!!!!! I SO WANT TO GO THEIR AND TAKE PART IN THEIR RIDING PROGRAM!!!!!! IF U THINK THE SAME THING LIKE COMMENT RIGHT AFTER ME!!!! LOVE LANI'S SWEET AS CAN BE AND ROTFL ATTITUDE!!!!!!! PEACE OUT AND RIDE ON YA'LL!!!!!!!!!!!!!!!!!!!!!!!!!!!!!!!!!!!!!!!!!!!!!!!!!!!!!!!!!!!!!!!!!!!! This series is one of the best! It is by the same author who writes Heartland. Horse crazy girls, put this book on a list of books to read! this book was very good. it is very inspirational and has brought a lot of fun into books. i think that this book will inspire girls to keep believing that you really can do anything you want, even when there are set backs you don't need/want. Chestnut hill is amazing! I have read the first 10 books and can't wait to read the last two. My favorite horse is Morello and my favorite character is Honey. I love them!!! My library only has 2 and 3. :( I can't wait till we get to a bigger city! CHESNUT HILL is an amazing series written by Lauren Brook. I love how each book is written by a different point of veiw each time. And how inspiring the whole series was. It actually makes you feel like you are there at chesnut hill. (at least it did for me). i really liked the parts where they were with the horses and at the shows. They are just so amazing in the eyes of me and i'm sure in the eyes of a whole lot of the other peole that posted comments on this wall. I liked how they did so many fun things like have the halloween party go to horse shows go to the symposium for the speach from Amy Fleming from Heartland and so many more fun things. In the 3rd book Heart of Gold it was sad when Honey told her friends about Sam and how he had cancer. But that there had to be a sad part some where in the series am i right.But i liked the way that the author expressed Lynsey to make her sound like she was the snobby rich girl that she was. I also liked how there were some dates between the Chesnut hill girls and the Saint Christophers boys. This series also had quite a bit of information about horses and some ways that you can get to know your horses better. GREAT SERIES, GREAT AUTHOR, GREAT EVERYTHING!!!!!! I've read the 1st and 2nd book in this series, it looks alot like Canterwood Crest. Welcome to Chestnut Hill, an American boarding school where riding is top of the timetable and girls from different backgrounds are united for their love of horses. Lauren Brooke's second series "Chesnut Hill" is astounding! I suggest reading the whole series, where each book is focused on a different girl. Either Malory, Dylan, Lani, or Honey. I was sad to see that the series was only six books long! Welcome to Chestnut Hill ,an exclusive boarding school set among the rolling hills of Virginia. With a premiere riding program, Chestnut Hill is the best and brightest learn to shine. Author of the Heartland series! Chesnut Hill is such a great book!!! My favorite in the series is Heart of Gold. 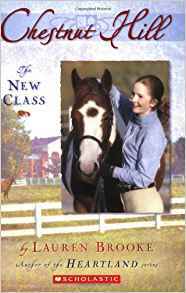 These books are about 4 best friends and their life, struggles, horses, and their life at a prestigious boarding school in Virginia named Chestnut Hill. Each book is written in a different character's point of view. I've read loads of them at least the first 9 of the series! They are all great. They are about four girls; Dylan, Malory, Honey/Felicety, and Lani. They all board at an amazing boarding school based in Virginia - CHESTNUT HILL! Its not about if your horse is expensive or world class in competition your horse class in your eyes. 5.TEAM SPIRIT. At the all schools riding league show the chestnut hill team fail to impress and are placed badly! some girls blame ms. Caramel (Dylan?s aunt)for there performance and try mean tricks to get her fired! Dylan is soon suspicious and starts a petition to support her. however when dylan gets her facts, secrets and truths mixed up the whole thing nearly ends in disaster!! 6.ALL OR NOTHING. Malary is amazed to be invited to fight for a place on the a level circuit. but there are many hurdles along the way for instance pony owning difficulties, facing the fact her ex boyfriend is there and coping with queen of mean lysey. but the biggest one is not seeing her dad all holls the big ? is will she actually go even ifs she?s offered a place. That?s for me to know and you to find out! 7.CHASING DREAMS. Chestnut hill is buzzing people believe a show jumper is competing for a place while a new golf teacher is causing patience to have a crush! but honey can't help thinking the gossip is getting out of control! the term has its ups like finding out what?s making dylan?s pony naughty and the downs like minnie for sale!!!!!!!!!! WHY? cass lani has problems and secrets of her own! This are an AMAZING!!!! series of books. They are all about horses and boarding school life! 1.THE NEW CLASS. Dylan's aunt is the riding instructor at chestnut hill! but not wanting the girls to think she's getting favors isum she doesn't tell anybody. She has many adventures like gaining reserve in the team and jumping her pony in the dark for truth or dare and getting caught! but when it comes to making the right friends none of them matter at all!!!!!!!!!!!!!!!!!! 3.HEART OF GOLD. Honey used to have her own pony called rockey and when hes sold she dosent think shell ever love another pony as much. but when patiennce(shes a mean girl at school)gets a pony and doseent look after it and she get injured honey devotes herself to looking after minnie.her twin sam is very ill and has cancer and honeys worried about them both find out how she copes by reading book number three!!!!!!!!!!!!!!!! 4.PLAYING FOR KEEPS.lani is a talented student but with all of her riding and softball training her studies mark slowly sink and her pearents tell her she must change schools!lani dose her best to prove them wrong by trying to balence riding,softball,the adams house western party and her studies.see if she stays or see if she leaves in this exiting book number. this is a cool book try reading it! I LOVE THE BOOKS 2! I've never heard of the Chestnut Hill series....Hopefully, I'll get to check it out! It sounds totally awesome! Yay for Chestnut Hill books! I love the Chestnut Hill books! They are so inspirational!